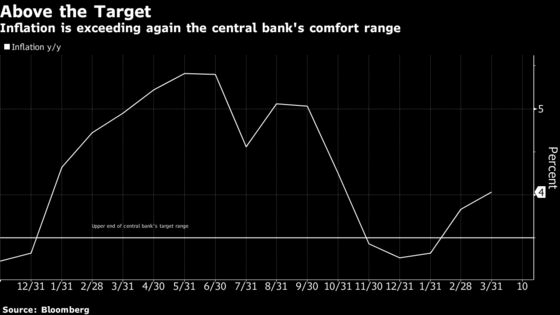 (Bloomberg) -- Romanian inflation accelerated to the fastest in five months on higher food and fuel prices, supporting the central bank’s recent hawkish stance. Consumer prices increased 4 percent from a year earlier in March, up from 3.8 percent in February, data released Wednesday showed. That compares with the 3.9 percent median estimate in a Bloomberg survey of economists. Prices rose 0.5 percent from the previous month.